Make a paste with the finely chopped wild garlic leaves, pepper and olive oil (you could also add chopped anchovies). 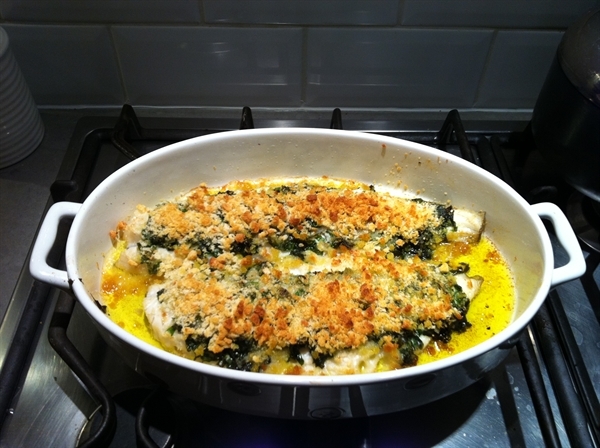 Place the cod loins in an oiled baking dish and spread the paste on top. Sprinkle with breadcrumbs and bake in oven for 20 minutes. Once cooked there will be a mild, subtle taste of garlic. The first of our wonderful forced rhubarb has arrived straight from the ‘rhubarb triangle’ and this recipe pairs it with lovely fresh Mackerel from Kernowsashimi. Oily fish and tart fruit is an old pairing and a very good one. Gooseberries are good in summer, but at this time of year lightly poached rhubarb does the trick. This works well with herring, too. Serves two. 1. Put the rhubarb, sugar, thyme (if using) and a tablespoon of water into a saucepan, and cook gently, barely simmering and partly covered, for five to seven minutes. Don't stir the rhubarb or it will lose its shape. When tender, remove from the heat. 2. Season the fish all over. Spread out the oatmeal on a plate and coat the fillets in it, pressing it on well. (If the oatmeal doesn't stick, brush the fillets with a little milk and try again.) Gently shake off any excess. 3. Heat two tablespoons of oil in a large frying pan over medium heat. 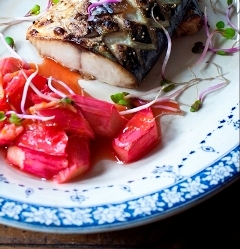 Add the coated mackerel fillets skin-side down and cook for two minutes. Carefully flip over and cook for a minute or two more, until cooked through. If you like, add a knob of butter at the last minute and, as it sizzles and foams, swirl it around and spoon over the fish – this enriches the crust. 4.Transfer to warmed plates and serve with steamed purple sprouting and new potatoes. Moss Hadley's Market Garden, Wingham, Kent. 1) Heat a large frying pan and fry together the curry paste, onion and garlic pickle until the onion has softened a little. Add the red pepper, stir well and add 100ml water as well as the tomato puree. Turn the heat down to medium and let it cook a couple of minutes. 2) Crumble in the stock cube and add the vinegar and sugar. Add the fish and stir, cooking for 5 minutes until the fish is tender. To thicken the sauce, add 40ml water to 2 teaspoons cornflour and stir. 3) Add this to the sauce and stir well to thicken. Sprinkle with a little fresh coriander, and serve with fluffy basmati rice. Created by Tiffany Nestour of Kentish Town using farm-direct ingredients. The vegan food with a cheesy, nutty taste made from primary inactive yeast without additives or preservatives. I had never cooked wrasse before developing this recipe – it has a delicate flesh reminiscent of plaice and demands gentle cooking or quick tempura-style frying. Its soft texture is ideal for young children and the tang of lime and coriander lift this out ofthe ordinary. One tip – if you plan to have this with steamed potatoes as we did, put the spuds on a good 10 minutes before the fish goes in the oven! 1. Preheat oven to 200c . Take a large sheet of aluminium foil and butter an area in the centre large enough for the fillets to sit in one layer. Tear the bayleaf in two and lay on top of the butter. Place the fillets on top and drizzle with olive oil. Using a potato peeler, pare off two strips of lime peel and place these on top with a pinch of sea salt and a grind of black pepper. 2. Bring up the foil into a parcel and pour in the wine before sealing it securely. Place in the ovenfor 15 minutes. 3. Meanwhile, grate the remaining lime zest into a bowl and add the coriander with a pinch of salt and some freshly ground black pepper. Add the 125g butter and get squidging with ringless fingers to mix thoroughly. Form this into a sausage shape and set aside. 4. When the fish is done, undo the parcel and carefully lift each fillet onto a plate. Top with a couple of slices of the butter . Pour the juices from the parcel into a small jug or bowl for use at the table. Serving suggestion: This eats beautifully with simple steamed potatoes, greens and broccoli. I had never even thought of eating such a thing until I saw this on the Farm-Direct site. I was intrigued, but concerned that it might taste like cod liver oil! I don’t actually enjoy liver unless it’s foie gras (yes, yes, I know!) but when I started to research this I saw it being described as the ‘foie gras of the sea’ so I decided to jump in and get my feet wet. If you’ve ever had hot, searede scalope of foie gras you will find the same velvety, lightly wobbly texture here. The livers are incredibly rich and you’ll probably only eat a fairly small amount in one go – I would recommend this as something to serve as canapés if you have people round rather than as a meal per se. When raw, there is no fish odour at all, but once cooked there is a definite taste of the sea – but nothing like cod liver oil, I am glad to report! If I could liken the taste and texture to anything familiar it would be the corals of scallops, only more creamy. Oh, and not only is this liver guilt-free compared to my naughty favourite, it an awful lot cheaper too! Have a good look at the liver and cut away any obvious tubing with kitchen scissors. Rub it with the garlic and dust it in the flour. Sprinkle over a pinch of salt. Heat the dry frying pan over a moderate heat. Put the liver in and lower the heat, cooking it gently for ten minutes before turning it over for another ten. Take it out of the pan with a slotted spoon and keep warm. Off the heat, deglaze your pan with the vinegar, and stir well. Add the olive oil, wine and thyme. Pour this sauce over the warm liver and cut it into slices to be served on toasted brioche or rye bread. A further glass of sweet white wine to accompany goes very well indeed! As a starting point for a foray into the wonderful world of mussels, this is unbeatable. Very simple, super-tasty and inexpensive, I like to serve this as a starter for 4 or light lunch for 2, with lots of crusty bread to mop up the juices and a glass of crisp white wine. Go through the mussels, rinsing them under cold water and removing any barnacles or beards. Any mussels that are open, tap them sharply on a surface and if they don’t close,bin them. In a large pan which has a lid to fit it, melt the butter with the oil and gently sweat the onion and garlic until soft, over a low heat. This will take around 10 minutes –we want all the flavour and sweetness but no browning. Add a pinch of salt and a few grinds of black pepper, then tip in the rinsed mussels. Chuck in the parsley and pour over the wine. Give this a very quick cursory stir and put the lid on. Take the lid off after 3 minutes. If the mussels are open, they are ready! Pour in the cream, stir and serve in bowls deep enough to allow you plenty of sauce!